In an affidavit filed before the Supreme Court, Hadiya's father Asokan K.M. has now alleged that attempts were made to take Hadiya alias Akhila to Yemen. The affidavit, filed in response to Hadiya's affidavit, offers a different explanation to her conversion. It claims that Hadiya came in contact with one Shanib, who introduced her to his elder sister, Sherin Shahana. Through Sherin, Hadiya met her husband Fasil Musthafa, who offered to make Hadiya his second wife and take her to Yemen. 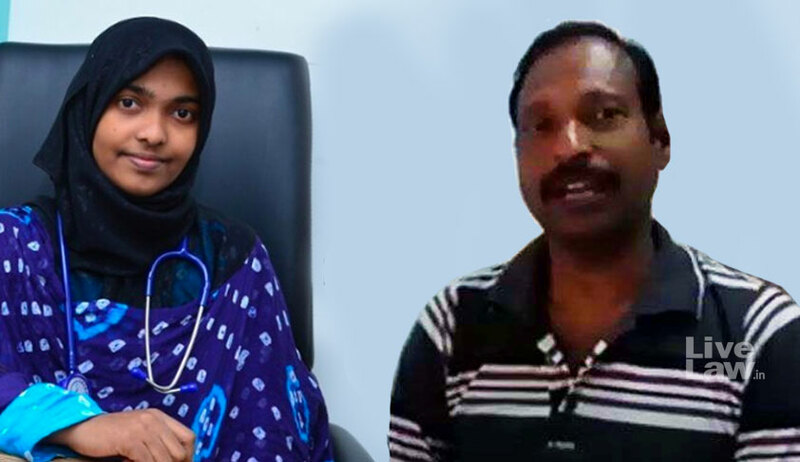 The couple then allegedly took Hadiya to Ernakulam and got an affidavit sworn before one Davy AC, Advocate and Notary to the purported effect that she had become a Muslim. Subsequently, she was renamed 'Aasiya'. Mr. Asokan submits that all this was disclosed by Hadiya to her friend, Ambily, who then objected to Hadiya's decision, following which, Hadiya backtracked. Mr. Asokan claims that all these facts have, in fact, been culled out by the Police and are available in the case diary, submitting, "At the time, the Kerala State Police did not properly investigate this angle of the case although they have clearly mentioned in their Police Report that SherinShahana and Fasil Musthafa had a plan to send her off to Yemen. The NIA may be called upon to disclose their investigation reports on this angle of the case." He then states that Hadiya nevertheless "fell into the trap of Faseena and Jaseena", the two students who were Hadiya's hostel mates and who succeeded in influencing her for the conversion. Mr. Asokan also elaborates on his attempt at recording a telephonic conversation with Hadiya, when she told him about her plans to go to Syria for sheep rearing. He submits that while he could not record the first telephonic conversation with her, he tried recording another conversation with her on 12 July, when he deliberately referred to their previous conversation, but she was on guard. He explains, "That in July 2016 while I was talking with my daughter, she told me that she was planning to go to Syria for sheep rearing. I was shocked to hear it as during that period, youths mainly from Hindu and Christian communities were being trafficked to Syria for joining Islamic State of Iraq and Syria (ISIS for short). I discussed about this with my close relatives. They told me that there should be evidence for approaching the Court again especially she was with the 8thRespondent as per the judgment of the Hon’ble High Court. So, having made preparation for recording our conversation I again called her. During the course of our conversation I asked her about her plan of going to Syria, she clearly told me that she had a plan to go there but she dropped it. I recorded her statements. There was no difficulty for me to understand that she was talking in this manner as advised by the 8thRespondent when my daughter told the 8th Respondent about her conversation with me about her plan to go to Syria." He also denies allegations of his wife trying to poison Hadiya, submitting, "My wife was always looking after her with full love and affection. She cannot endure even the slightest harm or suffering caused to her. She is always praying for Akhila’s well-being. My daughter alleges that my wife was trying to poison and kill her or cause harm to her. My wife cannot even dream of causing the slightest harm to our only daughter, without her, we have nothing in the world. These absurd, far-fetched and fanciful allegations show how deeply she has been brainwashed and indoctrinated. The first and last lesson radical groups give to the persons brought under their fold is to hate their parents unless they follow their path. My wife cannot even dream of causing any harm to my daughter." "The vulnerability and gullibility of Akhila is quite evident from the fact that she has abjectly surrendered herself to complete strangers who adopted her into their fold, offering her shelter and protection and further imparted religious indoctrination in an isolated environment. Akhila’s constant need for a guardian despite being an educated adult goes to show her extreme vulnerability. These are signs not of an independent and educated women who is standing on her own feet and does not need to be dependent on anybody else. There is no doubt that Akhila is a vulnerable adult and therefore the High Court’s protective orders in the aforesaid petition acting, inter alia, under its inherent jurisdiction was justified and warranted in the peculiar circumstances of this case." "I embraced the faith/religion of Islam on my choice as per my conscience and on my own free will after studying about Islam and thereafter I married a person, namely Shafin Jahan, the Petitioner herein, from the same faith as per my choice and on my own free will. However, despite the fact that I submitted repeatedly on affidavit, through my counsel and also in person, as the case may be, before the Hon’ble High Court of Kerala that I made the above choices (of my religion and my life-partner) on my own free will, the Bench of the High Court did not heed to my submissions." You may read the affidavit here.